Late but I hope not too late comes my contribution for bread baking day #27 hosted by Canela and Comino from Peru calling for Pan Latino (Latin Bread). Since both of our daughters spent one highschool year in South America (Brasil and Uruguay) and we received several students from Colombia we have a special relationship with this continent. In 2003 we spent a wonderful 4 week vacation in Brasil. For this event I decided to make some simple coconut rolls, pãozinhos de coco, adapted from a recipe I found here. I used milk instead of milk powder and water, a little bit more than in the original recipe, and I used less yeast. The lightly sweet rolls are very soft just as I remembered them from the breakfast in one of our pousadas. Mix the dry ingredients in the bowl of the stand mixer. Dissolve yeast in the milk, add coconut milk. Pour the mixture into the bowl and start kneading on low speed until the dough comes together. Add the butter in flakes. Mix on second speed for 5-8 minutes. The dough will be elastic and clear the walls of the bowl. Put the dough into a lightly oiled bowl, cover and let ferment for about 75 minutes or until the dough has doubled in volume. Put the dough onto the working surface (no flour is needed). Divide the dough into 16 parts (50-60 g each). Roll into balls and place them onto a paper-lined baking sheet. Cover and let rise for about 60-75 minutes. 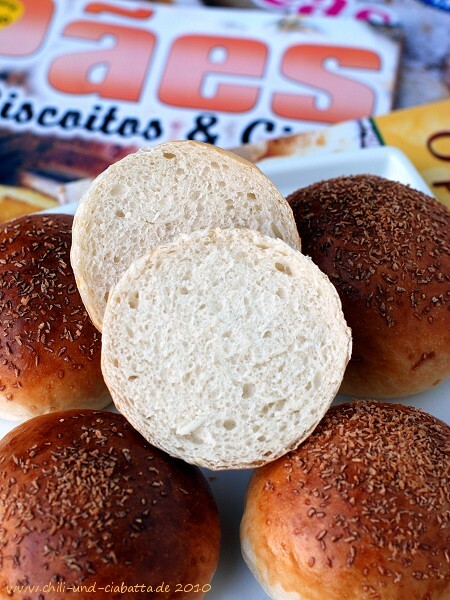 Glaze rolls with egg wash and sprinkle with shredded coconut. Preheat the oven to 180-200°C. Bake until the rolls are golden brown, 18-20 minutes. I never had thought of Bread with Coconut milk. What a fun idea! 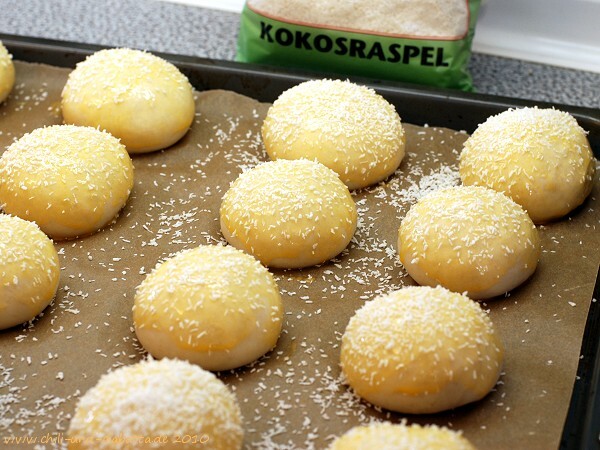 Ich liebe Kokosnuss, diese Brötchen sind also genau nach meinem Geschmack. These look ABSOLUTELY delicious!!!!!!!!! I want to make them! Thanks so much for your participation in this months BBD! I LOVE coconut. So this is the perfect bread for me! 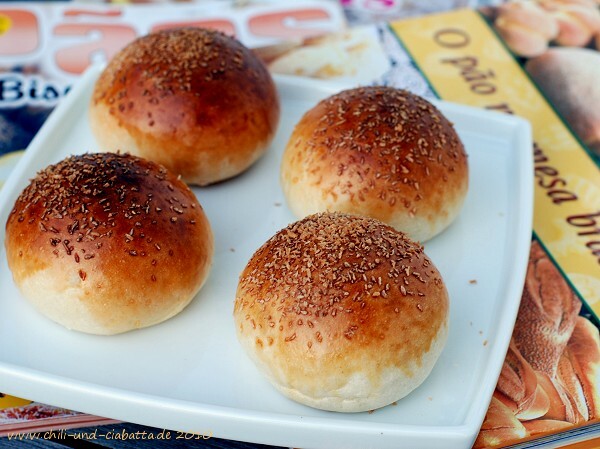 Wonderful buns, they’ll be on my to-bake list. Thank you for posting this lovely bread!